vidaXL Folding Butterfly Dining Table Solid Teak 59.1"x35.4"x29.5"
Set the stage for summer memories with this rectangular folding patio dining table by International Caravan Home Furnishings. Made from premium and heavy duty Balau hardwood, the Royal Tahiti table serves as the perfect spot for alfresco dinners or drinking iced tea with guests. A weather-resistant finish helps protect it against UV rays to sustain its natural beauty, which you can extend by applying tung or teak oil to this rectangular folding dining table before storing it away. We needed a table for our patio that would fit over our umbrella stand. When we added the umbrella it looked beautiful. And it worked exactly as we had expected. The best part about this table is the quality of the wood. It had a Teak feel and look. Its heavy, so don't expect to just throw it around, but that is a plus once you get it set up. We haven't used the folding feature yet, but the thing is it doesn't seem like a folding table. It is extremely sturdy. I am online right now buying a second one for our beach house. My only caution: it makes your older wooden furniture look bad! Great, solid table, in beautiful wood. OK, so it's not teak, but I can't afford teak. I have received many compliments on this set (I bought four chairs too). What I love is that I can fold it up and take it in during the winter and preserve it against the coastal rain and wind. We did do the recommended teak oiling to help seal the wood. This table can be fold. Stable. Seems durable.Classy.Comfortable. Six people can eat in this table. I really like this table. I bought it for my screened- in porch to use for family dinners and it is very nice. The wood is really pretty. I bought 2 of the matching chairs and I like them as well.In fact, I am going to order two more! I bought this table because I need to remove my porch furniture in the winter and everything folds up. Genius! Love this table. Got here very quickly, easy to set up and beautiful. It will need to be treated periodically like all woods in Bend. Can't wait to fold it up for winter. Much better than a bulky patio that's heavy! Table is very sturdy and has a nice finish. Can be used in or outdoors. Very convenient to store since the legs fold up. Would definitely recommend. I liked the folding table because it makes it easy to store and transport when someone needs an extra table. I used teak oil to keep the natural finish. Ready for out door entertaining. This table is just what I was looking for. I love that it folds away when not in use. I store it away flat. I had to ask for assembly instructions. Once I had instructions, assembly was very easy. I am very happy with this purchase. The design is great, it folds up for storage. It seats 6. However as others have repeatedly stated 2 of the bolts do not fit because they are not counter set or long enough. Just not properly designed. You do need to modify the assembly. The finish on the table is not adequate, they should have sprayed on a sealant. We have wet sanded and sealed it with 5 coats of outdoor sealant. It looks great now. Table came quickly and appears as the same image on the site. Exactly as expected. However, the instructions are overly simplistic, so ended up fumbling to finally get it put together correctly. The big disappointment came at the end when I realized two holes aren't drilled to the right diameter to accept the bolts. I ended up having to go to the hardware store to buy bolts that fit. Very annoying but worked out in the end. Wrapped the table in a weatherproof tarp for the winter. When we unwrapped it for the summer, the finish was worn off most of the table and it warped. It's an attractive piece of furniture. It's great that it's foldable. It makes it easy to store it indoors and protect it from the weather. It could be a bit sturdier. The table seems a little bit wobbly when set up. Also, some of the edges are a bit rough -- and the stain is not painted evenly all around. Overall, though - the facts that it's portable and attractive are a big plus. It’s a nice table but, like other reviews that I read, the legs do not hold up the table. It needs a better system for a folding table as the top is very heavy and won’t stay up. We ended up reinforcing the legs with heavy screws so its strong but no longer foldable. I use this inside as a computer desk. Nice and sturdy, pretty, and heavy. It works great! I have had this table for three years now, have kept it outside and never treated the wood. It is still in great shape! I highly recommend this item. Even the metal folding parts are still working well despite my neglect. Really Like This Table, BUT . . .
My only complaints about this table are the difficulty in putting it together. It can't be done by one person. Two holes were too small for the screw caps. Neighbor widened them by twisting a large screw driver inside the holes. And, I failed to mimic the "instruction" drawings. Instructions were very sparse. 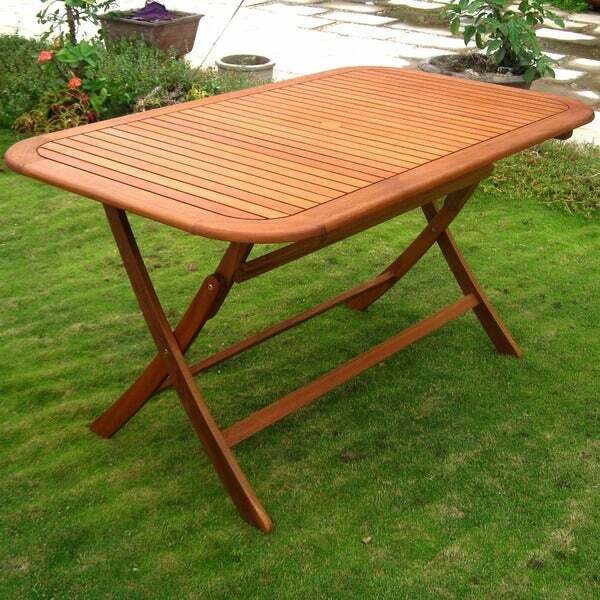 However, the table was most attractive, no wobbling, a honey color, accommodates six people, but NOT waterproof. During the following days of rain, two of the curved corner pieces began to warp upwards. Addendum: I did not use any sealant, varnish, or anything like that on the table. It has been on my patio, in the sun and rain, since I got it. I live in FL. In the first year, the table warped all over the place, and the wood got all weathered-looking which was not attractive. I would not buy again..
Nice for my outdoor patio, however the wood weathers very quickly and the edge pieces of wood curl up a bit at the edges. We purchased this table to use outside but have found it useful for holiday and party gatherings inside as well. It comfortably seats 6 and is easy to fold and move around. We love the finish. We’ve used it with teak folding chairs, outdoor director chairs and bench seating. "Having trouble making it stay up. There is no catch when the table is standing. Have used duct tape. Not happy about this. Now afraid to put my food on it. Are we missing a part?" I believe the table was not put together correctly. Take the piece with the metal stops and turn it the other way. The diagram is very difficult to understand, but those metal pieces are the key to holding the legs when you put it up. It's nice looking but we gave this to our daughter less than a month ago and she tells us it is warping already. "Can this be out in the rain?" Yes this can be left in the rain. 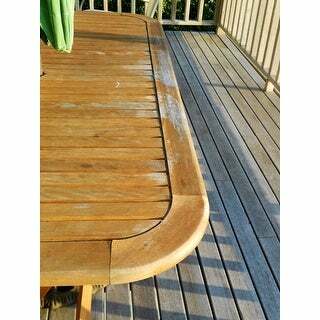 To preserve the natural beauty of your yellow balau furniture, apply a coat of teak or tung oil annually. Was looking for wooden furniture but needed something that could store easily. This was perfect! I liked the style. It folds up and will be easier to store. "how many will the table seat?" Hello dpj, this will seat 6 people. Have a great day! "How can I get a plug for the umbrella hole, as I'm using the table on an enclosed porch?" Hello ithes523, this table is a perfect addition to any yard! Unfortunately, this table does not come with a plug. I would recommend checking with your local hardware store. Thank you for shopping with us. "What is the weight of this table? thank you"
"Does it have a hole for an umbrella?"